Halfway between Costa Paradiso and Castelsardo, Isola Rossa is the little fishing village on the Costa Rossa that charms visitors with its unspoilt natural beauty and unforgettable fiery red sunsets. A pace of life marked by the slow rhythms of nature and the breathtaking landscapes of the promontory are typical of Isola Rossa, a little village on the Northern Sardinian coastline where everything has another colour. The enchanting cliffs painted in the warm tones of porphyry (purple-red granite) surround the small village overlooking the Golfo dell’Asinara, a favourite destination for couples and families looking for privacy and relaxation. Isola Rossa: where is it? Isola Rossa, near the town of Trinità d’Agultu and Vignola, is a popular seaside resort on the Costa Rossa, the coastal stretch of Gallura between Santa Teresa di Gallura and Badesi. Reachable in an hour by car from Olbia or Alghero Fertilia Airport, the Costa Rossa is a part of the island that has not yet been fully explored and where the beaches of fine white sand and crystal clear water are equal to if not more beautiful than the more famous ones on the Costa Smeralda. The centre of Isola Rossa winds between the main street and the seafront in the direction of the marina, a strategic landing point in Northern Sardinia from which to go on exciting boat trips. Shops, restaurants, ice-cream parlours and small handicraft boutiques alternate with bars offering views over the bay, which are especially popular at aperitif time or for a snack between one swim and another. Actually in the town and a stone’s throw from the Hotel Relax Torreruja are the Spiaggia Lunga, awarded the Blue Flag in 2018 and equipped with sun loungers, umbrellas and water games and the little beach of Li Femini, both with shallow transparent water. Just five minutes from Isola Rossa is another of the Costa Rossa’s 2018 Blue Flag beaches, the marvellous La Marinedda bay which encircles the sea that stretches from the promontory at Isola Rossa to Punta Li Canneddi. 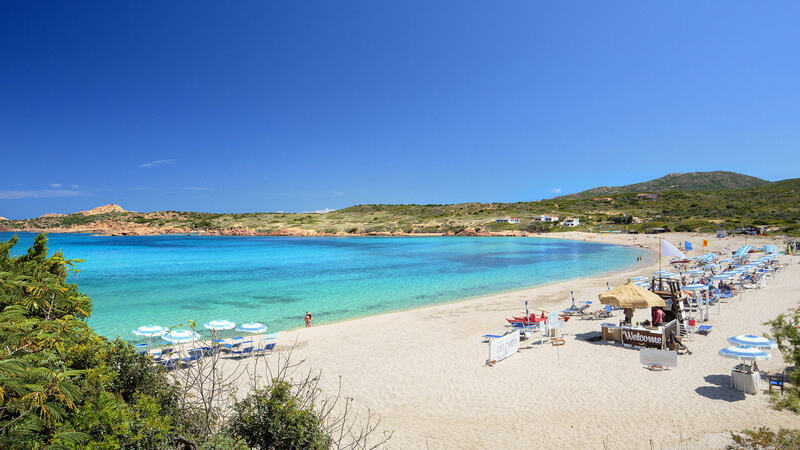 The 5-star Hotel Marinedda Thalasso & SPA overlooks this long crescent of fine white sand and turquoise sea which is also equipped with umbrellas and sun loungers, kiosks and water sports and most of all, surf. Along the jagged coastline that continues towards Costa Paradiso a number of small hidden coves bewitch the observer with their wonderful colour games between the rocks and the sea. 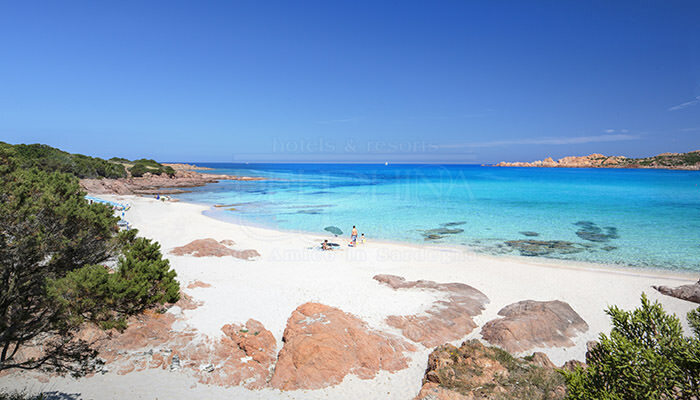 These include Cala Rossa, which can be reached with a 10-minute walk along a dirt track that starts from La Marinedda. A wild unspoilt beach dotted with rocks that create perfect little pools ideal for swimming for children and for snorkelling. By following other hiking trails on the coastline you arrive at the small beach of Li Tinnari, a true natural paradise, while with a few more steps you reach Li Cossi, a bay sheltered by the wind, much appreciated by couples seeking privacy and intimacy, and families with children. For nature lovers looking for peace and quiet, the beach at Li Feruli in the direction of Badesi is rarely visited even in July and August and can be reached in just 10 minutes by car from Isola Rossa or by an easy path that starts from the Lunga beach. The Costa Rossa is a popular destination for hikers and trekking enthusiasts. The low and medium grade trails that follow the coastline provide a range of emotions and lead to rarely visited little beaches set amidst the lush perfumed Mediterranean macchia or scrub. For water sports enthusiasts the bay at La Marinedda is a paradise: surfing, SUP, windsurfing, catamarans and wakeboarding liven up this delightful beach surrounded by nature. It’s always fun to try and ride the waves in one of the most famous hot spots in Italy and home to the Marinedda Bay Open surf contest, which between the end of August and the first half of September attracts some of the top surfers on the international scene. It is also worth discovering Isola Rossa with a mask and snorkel! Snorkeling and diving between the cliffs of Punta Canneddi and Costa Paradiso will take you into a wonderful underwater world where you can admire red corals and gullies populated by any number of types of fish. 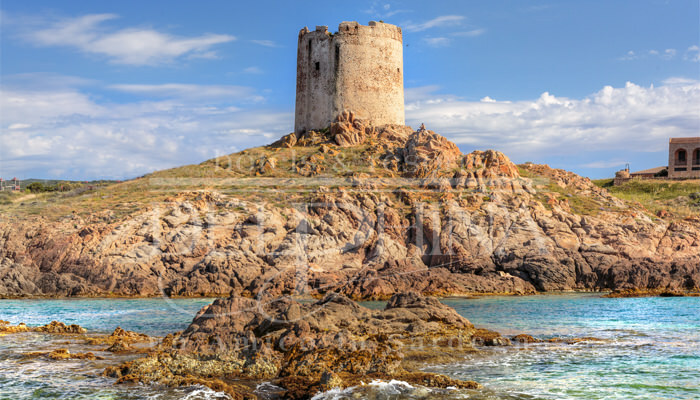 Among the other activities to do during your holidays in Isola Rossa you must not miss out on an unforgettable boat trip to Corsica or the La Maddalena Archipelago or a fun fishing trip with friends off the teeming waters of the Golfo dell’Asinara. If you are looking for fun and games for children and adults alike, don’t miss a day at Acquafantasy, the nearby water park with panoramic views of the coast. Isola Rossa has a long history because its strategic position made it a landing and lookout point on the Golfo dell’Asinara. The Tower is testimony to this, legacy of the period of Spanish rule and dating back to 1595. 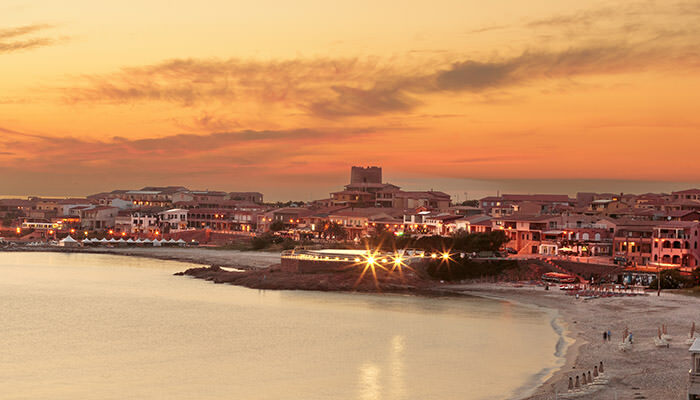 During a walk to the marina it is worth stopping to enjoy the sunset and take pictures of your holiday in Sardinia. From Isola Rossa the inland Gallura area is literally just around the corner! In about 20 minutes by car you reach Aggius, a village of granite houses surrounded by a unique chain of hills and cliffs, nominated as one of the “Borghi autentici d’Italia (authentic Italian villages)” and a winner of the Orange Flag Award. Here, a perfect combination of tradition, history and innovation has created two museums and a contemporary open-air museum housing works by famous artists, among which the works / installations of Maria Lai and the murals of the renowned international street artist Tellas stand out in particular.